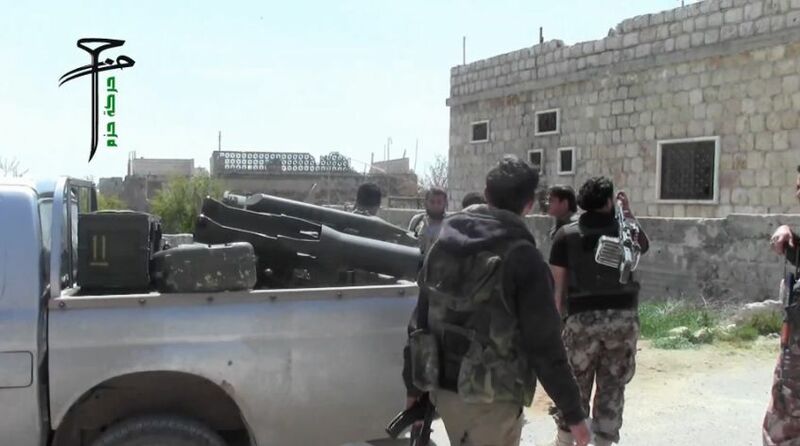 In early April, representatives of the armed opposition group Harakat Hazm from the Syrian province of Idlib uploaded a YouTube video showing Hazm combatants launching a missile from a TOW type anti-tank guided weapon (ATGW), near the town of Heesh. This video, representing the first time the TOW missile was identified in Syria, caused a stir amongst observers and the media. The TOW weapons system is a US designed ATGW, initially developed by Hughes Aircraft Company in the mid-1960s, and first fielded by the US Army in 1969. “TOW” stands for “Tube-launched, Optically-tracked, Wire-guided”, which accurately describes the characteristics of the initial TOW missile, and most of its successors and variants. Typical TOW systems are semi-automatic command to line-of-sight (SACLOS) principle weapons, which require the weapon’s operator to keep his target in the weapon sight until the missile has impacted. When the missile is fired, a sensor in the sighting system tracks a flare in the tail of the missile. The targeting computer attached to the firing post transmits flight corrections to the missile by way of two extremely thin wires which unravel during the course of the munition’s flight. There are nine common missiles in the TOW family, with several versions of most of these having been produced. Additionally, there are a number of prototype or limited rate production models believed to have been developed. With the system having been in service for nearly 50 years, and still being produced by Raytheon today, the upgrades and modifications in that time have been significant. In terms of capability, the modern TOW vastly outstrips its ancestor. Some of the TOW family of missiles. Original source unknown. The TOW missile model seen in Syria, as identified by markings visible in this video, is a BGM-71E-3B, or TOW 2A. The TOW 2A was the first TOW family production missile to introduce a tandem warhead, designed to defeat explosive reactive armour (ERA). The missile weighs 22.65 kg with a 5.9 kg high explosive anti-tank (HEAT) warhead, containing 3.09 kg of LX-14 explosive composition. Armour penetration (using standard RHA testing) is estimated given as 900 mm. The TOW 2A has a range of 3,750 metres, with the missile’s S&A (safe and arm) device arming no closer than 30 m from the launcher. 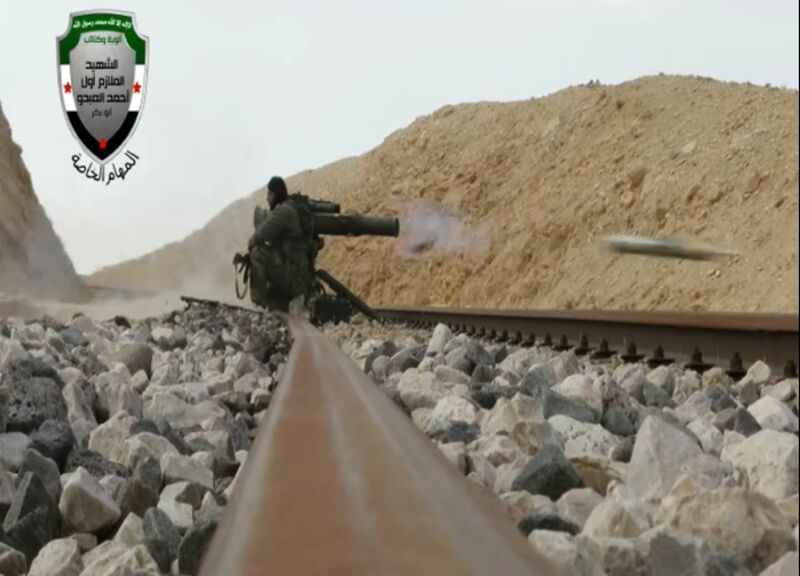 The TOW 2A is significantly more capable than early-generation TOW systems, and also represents a capability increase over many of the systems currently in service with the Syrian Arab Army (SAA), and those seen in the hands of anti-government forces. 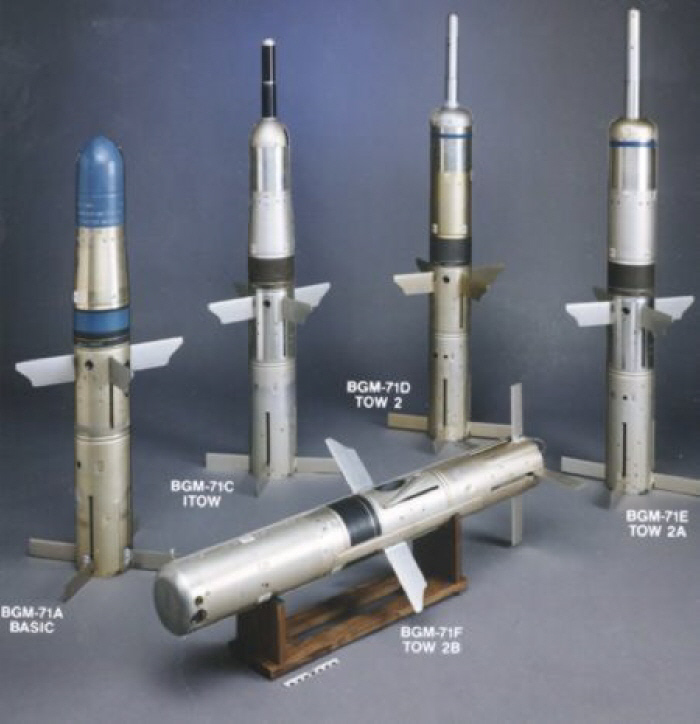 These diagrams, taken from a USGOV publication, show the TOW 2A missile and some of its major components. 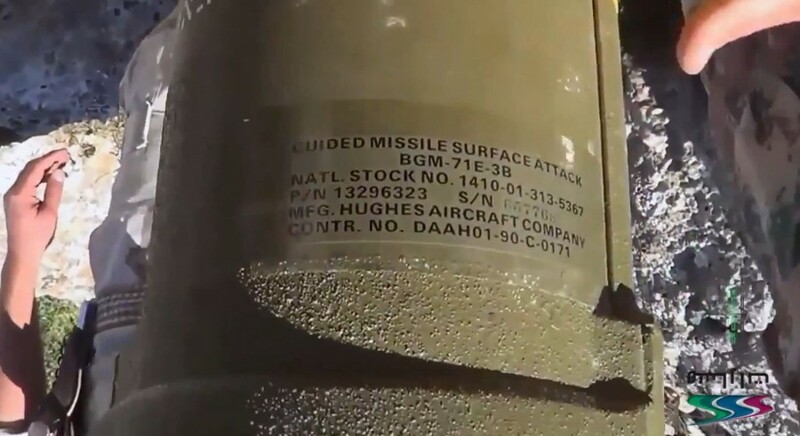 Missile tubes are marked with individual serial numbers, however in the Syrian example seen the serial number has been partially abraded, but may be “657769”. ARES has contacted the appropriate departments with the US government and Raytheon and asked for further information. The yellow bands towards the forward end of the missile tubes indicate that they contain high explosive (HE) rather than practice missiles, and the brown bands indicate the presence of a low explosive (launch rocket motor). TOW missile being fired by rebel group in Homs. Note nose probe (source). The National Stock Number (NSN) for the missile is visible in the video (see image below). A quick search for the NSN using the Defense Logistics Agency’s WebFLIS service shows that BGM-71E-3B missiles have seen service with both the US Army and US Marine Corps, with the Marines having recently become the primary managing organisation for this item. This particular example is marked as having been produced by Hughes Aircraft Company as part of a contract first awarded in January 1990 (see contract number, also visible in the image below). This contract was taken over by Raytheon when Hughes was purchased by them in 1997, and has been re-awarded seven times since its initial issuance, with the most recent award in 2004. Consequently, the missile in question was most likely produced between 1990 and 1997. Markings on a TOW missile tube in Syria. Videos of TOW systems in Syria immediately lead to an examination of the possible origins of such a weapon, and potential routes of supply which would have made the acquisition of such systems by anti-government forces possible. With the exception of limited numbers of French MILAN systems, the SAA is believed to only field Soviet/Russian ATGWs, and whilst the armed wing of Hezbollah has TOW systems, these appear to be confined to Lebanon; in Syria they have been largely using the same weapons as allied Syrian government troops (presumably for logistical reasons). Because of this Hazm are unlikely to have captured these systems in Syria, and probably acquired them from foreign sources. The state or group which supplied these systems remains unclear. TOW system in use with a rebel group in Daraa (source). US produced TOW missiles of one variety or another are in use with over 40 international armed forces, including many of Syria’s regional neighbours including Bahrain, Chad, Egypt, Ethiopia, Israel, Iran, Kuwait, Lebanon, Morocco, Oman, Saudi Arabia, Turkey, UAE, and Yemen. Additionally, TOW systems are believed to be in the hands of a few non-state armed actors, including Hezbollah. Other countries have also produced TOW missiles. Egypt produced early model TOW missiles for some time beginning in the 1980s, however it is unknown whether they continue to do so (it seems likely that they do not, given TOW missile purchases from abroad, including the US, in the past decades). Whilst Iran does produce a modified copy of the TOW (the Toophan), the markings on the missile launch tube pictured above indicate it is of US origin. Unassembled TOW systems in use with Hazm (source). 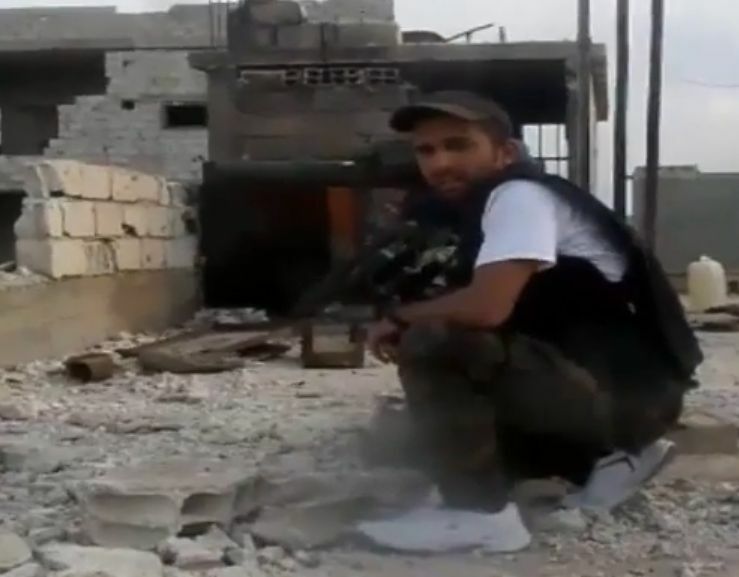 Since the initial video was released, another two groups of militants in the two different provinces of Syria – Homs and Daraa – have also uploaded videos showing their possession of TOW missiles. It seems likely that these other received TOW ATGWs from the same source as Hazzm. Various commentators and analysts have pointed to a handful of western or western-aligned states as being responsible for the provision of these systems to anti-government fighters, but little concrete evidence has been offered. 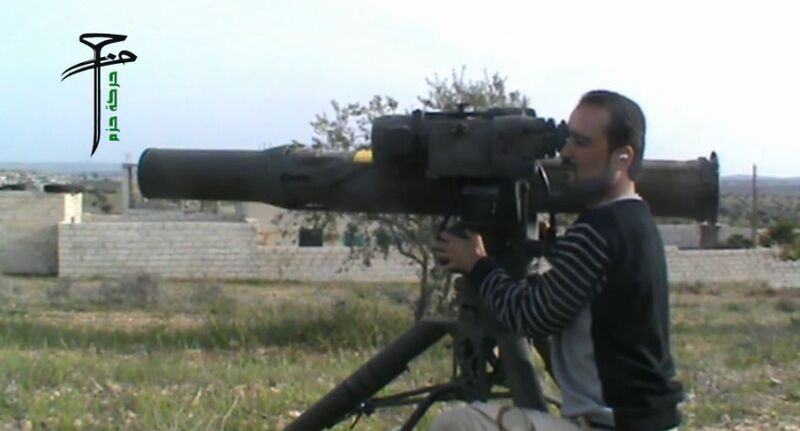 Agence France-Presse reported that according a knowledgeable source, “moderate, well-organised fighters from the Hazm movement have for the first time received more than 20 TOW anti-tank missiles from a Western source” and that “more have been promised should it be proven that the missiles are being used in an effective way”. Whilst it certainly seems likely that these ATGWs are being supplied by an outside state – possibly a recipient of US foreign military aid or a purchaser of surplus US weapons – other possible avenues of ingress exist, and we would need more evidence to state such as fact. 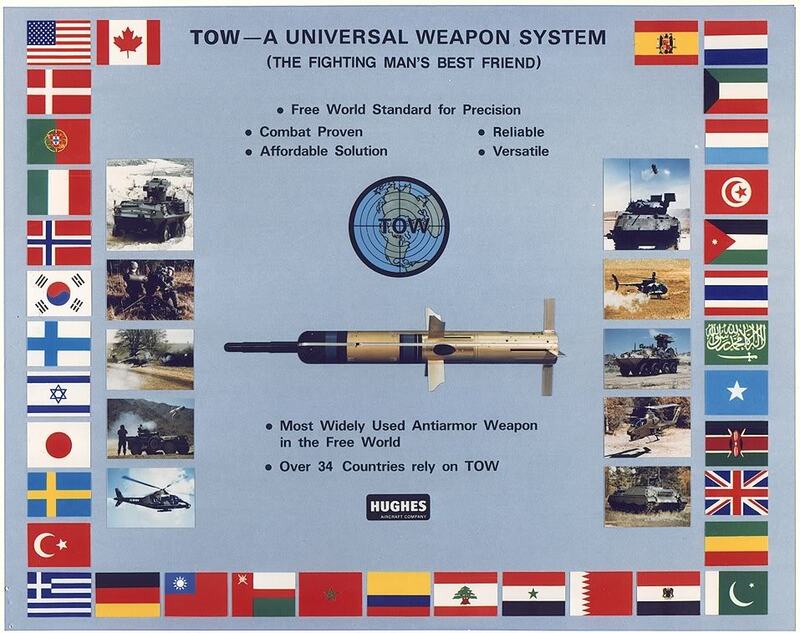 An advertisement from Hughes Aircraft Company, likely produced sometime in the 1990s, showing the TOW-2A and highlighting the worldwide appeal of the system. With thanks to Eliot Higgins, John Ismay, Charles Lister, and Michael Weber. Feature image taken from this video.